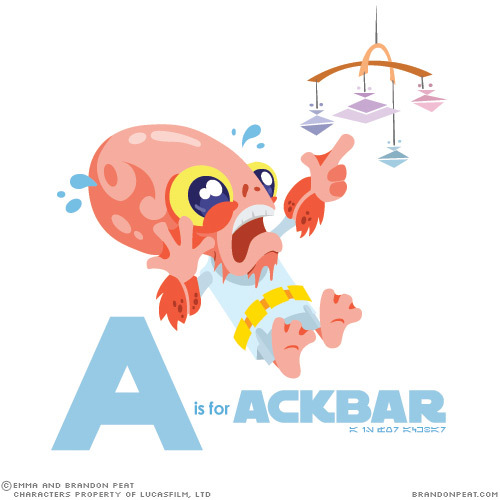 geek with curves: Interview with Brandon & Emma Peat: Creators of "A is for Ackbar"
Interview with Brandon & Emma Peat: Creators of "A is for Ackbar"
An adorable Star Wars alphabet book took the internet by storm in December. I believe the word is viral. The book “A is for Ackbar: an alphabet from a galaxy far, far away” made fans squee and melt at cartoon images of characters from the original Star Wars films and the Expanded Universe. Brandon and Emma Peat designed the images as decorations for their newborn son Tycho's nursery. They had to stick with posters and prints because they rent the space, and since they are artists, it was only fitting that they create them. They decided to collect the images into a book as a thank you gift for everyone that donated to their son's college fund. Reference the viral comment above – they closed the donation drive early. I was lucky enough to catch it at the beginning, and I dropped whatever unimportant thing I was doing when I saw that the package arrived. I flipped through once in that over-excited way that doesn't let you actually absorb what you're looking at. Then I slowed down. I looked at each letter. 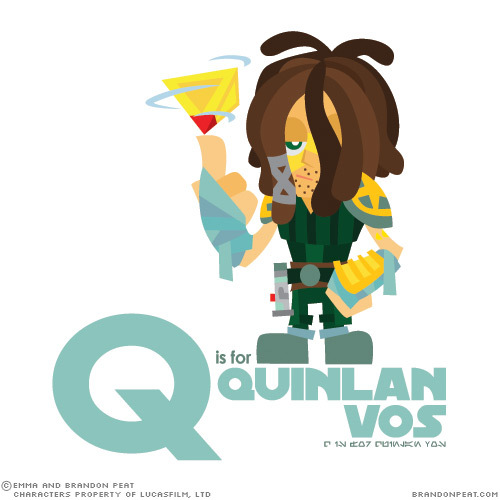 “J” for Jabba (with a cute Salacious Crumb), “Q” for one of my favorite Jedis, Quinlan Vos, and “V” for Vader. The combination of Star Wars and adorable almost slayed me. I was also lucky enough to get Brandon and Emma to answer a few questions about the creation of the book for me! GwC: How long have you been a Star Wars fan? What is your first memory of loving Star Wars? Brandon: Well, I grew up in a household bereft of Star Wars. My dad is an ardent Star Trek fan, which he raised me on from the time I was a baby, and refused to tell me about Star Wars since he thought it was inferior. But somehow I found out about Star Wars anyway, and spent hours reading my best friend’s Star Wars Technical Manual, absorbing everything I could about the universe before I had even seen the movies. I didn’t actually see the classic trilogy until I was in 6th grade, and then the following year the Special Edition came out in theaters and I got to see them all again on the big screen! I’ve been a big fan ever since – though I should state for the record that I still love Star Trek (and many other sci-fi’s) equally. Emma: I think I first saw Star Wars when I was in 4th or 5th grade…I was at a friend’s house, and only saw bits. I think that was my experience with science fiction in general, actually – I had some random early exposure, but it wasn’t until college (where I met Brandon and many other awesome nerds) that I was properly educated on the radicalness of sci-fi. GwC: I was so glad to see some of my favorite E.U. characters (especially Quinlan Vos!) in the book; are one of you more into the books/comics/games? What made you choose these characters? Brandon: Uh, that’s me for sure. The EU is probably my favorite thing about Star Wars – the fact that there’s something interesting around every corner in this universe. My favorite EU stories (the Thrawn trilogy, the X-wing book and game series, the Jedi Knight series of games, the Tales of the Jedi comics and KOTOR games, the Republic Commando game and books) I cherish as much, possibly even more than the Original Trilogy. Sure, those movies are great, but you can’t watch them over and over forever. It’s more fun to experience new adventures within that world. Emma: I definitely like the Original Trilogy most of all, and while I haven’t read any of the books or comics, I do feel that I have a decent knowledge of the Star Wars universe simply from picking Brandon’s brain. Last summer we both participated in a Star Wars tabletop RPG campaign with a group of our friends, and it really got my creative juices flowing about the whole universe. I had a great time researching my character and creating her backstory. No ships, no objects, no species names, to keep it simple for a child to visually understand. 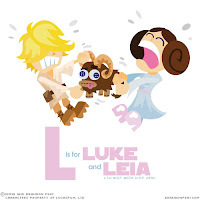 We broke this rule once, with E is for Ewok, but I’d rather have W be for Wedge than for Wicket, so there you go. Characters are just more fun to draw, and easier to portray is such a childlike style. I’ll spare you Brandon’s normal tirade and simply say that, like most Star Wars fans, we prefer the Original Trilogy. Our kids will definitely start with 4-5-6, and only get to watch 1-2-3 once they discover (on their own) that the Prequels do exist. As Brandon said above, the EU is one of his favorite parts of Star Wars, and he definitely intends to point Tycho towards the right supplementary material. We tried to keep the illustrations as violence-free as possible, which was a real challenge with some of these characters! That meant no guns and no references to fighting. We also tried to minimize the number of “evil” characters…Brandon really wanted to squeeze Darth Revan in there but I wanted to limit our Darth count. R2-D2 is more important and adorable anyway. So eventually you wind up with a list of options, and you do some shuffling. 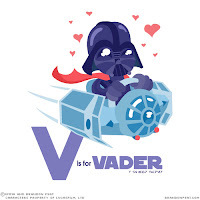 Originally D was for Darth Vader, and V was for Veers. But Brandon decided that Dash Rendar would be more fun to draw than a stodgy general, so Vader was moved to V and Veers got the axe. We felt bad about leaving out Lando, but L already had Luke and Leia, and we didn’t want to triple up. Brandon: And you would not believe the number of comments I’ve seen around the internet along the lines of “THIS LETTER should be for THIS CHARACTER OR THING” or “Here’s MY list!”, usually with a very harsh, accusatory tone suggesting that you did this wrong. To those people I say: this is the set that I, a knowledgeable Star Wars fan, wanted to do, with the characters I liked the most or felt were most important. If you don’t like it – make your own! GwC: Emma, I read that the idea for the project was all you, what made you choose Star Wars? Emma: When we first found out that we were pregnant, it was a little scary. It was definitely a surprise, and we weren’t sure we’d be up to the challenge. Since we are both artists, I thought that illustrating a children’s alphabet together would be the perfect way for us to not only prepare Tycho’s room for his arrival, but to prepare ourselves mentally as well. After some initial creative head-butting (inevitable when two artists are working together! ), the project ended up being very cathartic for both of us. As far as choosing what to depict with this alphabet, Star Wars characters quickly rose to the top of the list. We both love it, it’s fairly kid-friendly, and there’s definitely enough material in that universe to cover every letter easily, so we wouldn’t have to stretch when it came time for the tricky letters like Q, X, or Z. And I knew that Brandon would want to introduce our children to Star Wars as soon as possible, so this seemed like a kid-friendly first step. GwC: How long did it take to put the book together? Brandon: Each illustration began with one or two quick little doodles by me, then a larger, more detailed pencil drawing. For most of the characters, I already had a pretty solid idea in my head about how to portray them or what visual gag to put in – whenever possible, I tried to hint at the character’s personality or a relevant plot point. Ackbar is scared of his trap-like Star Destroyer mobile. Assassin droid IG-88 is juggling a variety of grenades. Kyle Katarn is holding his lightsaber and the Death Star plans he helped steal. Quinlan Vos is spinning a Sith Holocron on his finger, referencing his brushes with the Dark Side. Boba Fett is jetpacking away from a Sarlacc-looking hole of squirming worms. Han and Greedo are shooting finger guns at each other…and Han shot first. Emma: Then I would scan that drawing and trace it in Adobe Illustrator, creating that clean, vector look. We wanted to minimize the amount of linework in the art, opting for a Samurai Jack-esque style of shapes without outlines whenever possible. I then chose the colors, tweaking them endlessly. I tried to stay away from the color black so as to keep the illustrations friendly and fun. This was difficult, given that about half of these characters dress in black! The color palette of Star Wars is really quite drab, most of the time. So I would substitute a deep blue, purple, or brown. Then it was back to Brandon for the type treatment and a final joint approval on each illustration. All in all, we probably spent an average of 5 hours per letter, or about 130 hours for the entire alphabet. These illustrations were originally planned as wall art (and we have a very nice copy for ourselves), but collecting them into book form was extremely easy too. The only extra work we really had to do was an additional family portrait illustration for the book’s introduction. GwC: Did you expect the almost viral nature of the book? It feels like I saw it all over Facebook, Twitter, and the blogs I follow! Brandon: In retrospect, the equation of “Star Wars + Cool Art = Internet Sensation” seems obvious, but I was honestly blown away by the amount of traffic my site got, to say nothing of all the people who re-blogged, etc, to spread it to the far corners of the internet! As you probably know, we produced a limited number of the books as thank-you gifts to friends, family, and others who donated to Tycho’s college fund. The donation drive was only intended to run for the month of December, but we ended up having to close it after about a week due to the excessive demand! GwC: Do you have plans to make more of these available, and can you maybe give a hint as to when? Brandon: Sadly, not at this time. It was only intended as a super-limited thank-you gift; Emma and I simply don’t have the time and money to keep producing and shipping these! I would love to sell them outright, of course, but that could be construed as a copyright infringement against Lucasfilm, which we certainly wouldn’t want. I had considered simply releasing the art for public download and peoples’ personal use, but once you let the hi-res files get onto the blogosphere there’s no going back. I’d be concerned that people would alter our art, or attempt to pass it off as their own for profit, which would be super not cool. Emma: Seriously, though, this project was just a way for two designers to prepare a room (and themselves, mentally) for their first baby. We’re both thrilled and a little humbled that so many people have enjoyed the illustrations. We’re not looking to make a profit here – Brandon is already running a successful one-man design business – but we would love to find a Lucasfilm-sanctioned way to disseminate this to a wider audience. Star Wars has given us a lot of good memories over the years, and we wanted to pass that on to Tycho…and maybe, Force willing, some other people as well. Someone has got to get Lucasfilms involved and get this thing out there. This is genius, I am so jealous I am just now hearing about this. The art is great, and witty enough for true fans to enjoy. I agree Lucasfilm really needs to know about this talented pair. This little book of pictures is AWESOME! I'm happy to have bought it and helped Brandon & Emma pay for young Tycho's college! Way to be creative and fun, and thanks for the help getting my little one addicted to Star Wars. I show the book to every Star Wars fan that comes into my house. :) I am so glad I got my order in, and I hope they are able to share it with more people some day.